The rosters for the 2015 Texas League All-Star Game were released Monday afternoon by league President Tom Kayser. 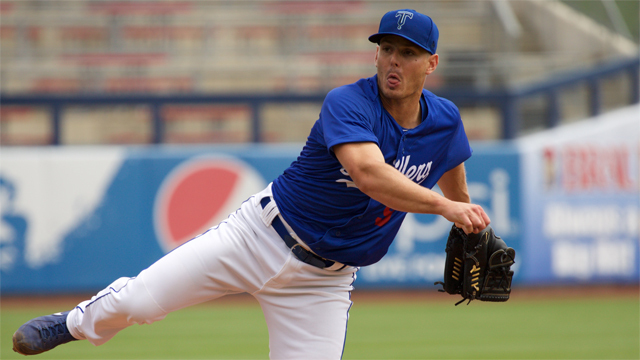 The Tulsa Drillers had four players named to the North Division squad, including a trio of pitchers. The four included hurlers Chris Anderson, Jeremy Kehrt and Jeremy Horst and shortstop Luis Mateo. The North Division side will be led by Tulsa manager Razor Shines and his coaching staff. He will be assisted by coaches Matt Herges, Shawn Wooten and Leo Garcia. Trainer Aaron Schumacher and Strength Coach Paul Sterrett will also be a part of the staff. Anderson leads the Drillers with five wins this season. The right-hander has a 3.78 ERA while holding Texas League batters to a .245 average. Kehrt has a 4-5 record with 3.19 ERA for Tulsa. In 12 starts, he has recorded 56 strikeouts and issued only 19 walks. Horst has been one of the top relievers in the TL this season, posting a 1.98 ERA in 22 total appearances. The lefthander has collected four saves in six opportunities. Mateo was selected as the North's starting shortstop. He has committed only three errors this year while batting .258. Complete rosters for both teams are listed below. (1) Chris Thomas of Springfield replaces Trevor Gott, who has been promoted to Los Angeles. (1) Colin Walsh of Midland replaces Tony Kemp, who has been promoted to Triple A. (2) Ryon Healy of Midland replaces Joey Gallo, who has been promoted to Texas. (3) Chad Pinder of Midland replaces Trea Turner, who has been trades to Washington. (4) Roberto Pena of Corpus Christi replaces Jorge Alfaro, who is injured. (5) Tayron Guerrero of San Antonio replaces Lance McCullers, who has been promoted to Houston. (6) David Martinez of Frisco replaces Vincent Velasquez, who has been promoted to Houston.